Going to the farmers market each week, and being inspired by what is in season at the moment, is something I will never tire of. Walking the aisles, smelling the sweet aroma of what is most available – there really is no experience like it. 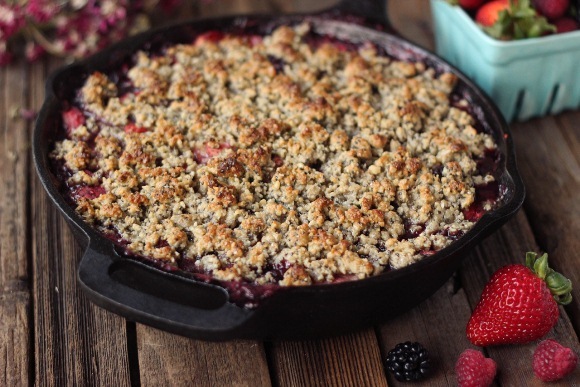 I have been dreaming of a delicious Spring inspired berry crisp for sometime now and I finally made it happen over the weekend. I have been making various fruit crisps for years, using all-purpose gluten-free flour and rolled oats, but I wanted to get creative and come up with a way to make the topping be totally grain-free, in addition to dairy-free. I am so excited about how this came together and it really is simple to make. I offered several ingredient variations too, so so whether you are paleo or even vegan, this recipe will work for all of you. The best part is, those without any dietary restrictions will love it, too! This juicy grain-free take on a traditional dessert is best served warm, fresh from the oven. 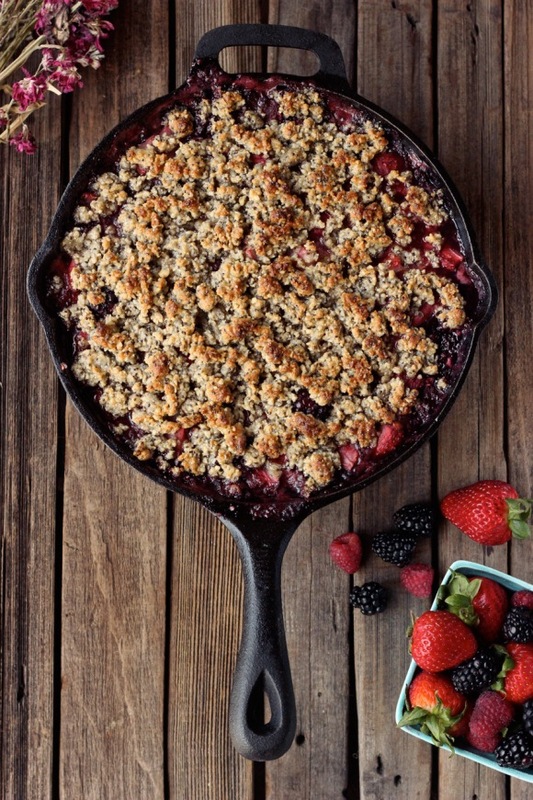 Use whatever varying combinations of berries you’d like, you can even add in fresh peaches or whatever fruit is currently in season near you. Preheat oven to 350º F. Very lightly grease a cast iron skillet or 8-inch square baking dish. Hull and halve or quarter the strawberries. Add all of the berries to a large bowl, sprinkle the arrowroot starch evenly over the berries, being careful not to dump it all in at once, and add the remaining ingredients. Mix very well to combine. 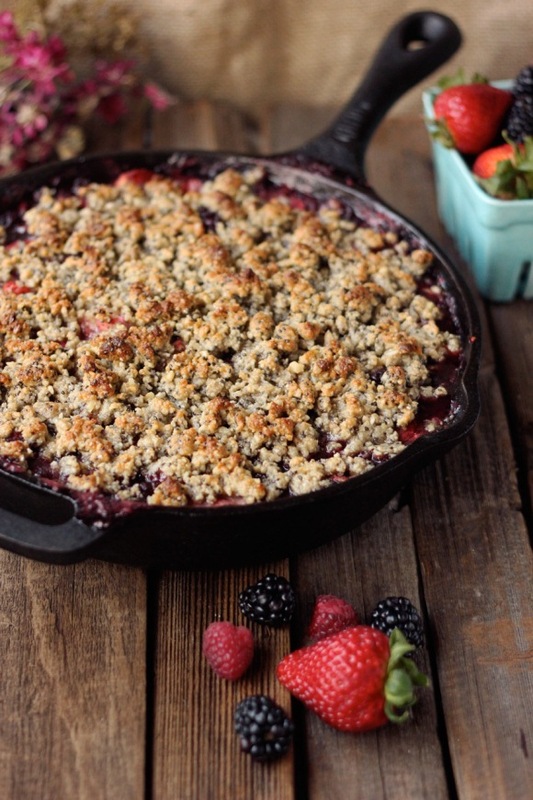 Add the berry filling to the prepared skillet or baking dish and set aside. Add the walnuts, sunflower seeds and chia seeds to your food processor. Pulse just a handful of times to chop the nuts and seeds, you don’t want to grind into a powder. You are looking for a fine chop with some texture. Add the almond flour, arrowroot starch, cinnamon and sea salt, pulse together a few times with the nuts and seeds. Then add the maple syrup (or honey) and your chilled solidified pieces of coconut oil (or butter). Pulse again a few times to create a crumbly mixture. You can also do all of this by hand, roughly chopping the nuts and seeds, adding in the remaining ingredients and cutting in the oil or butter with a fork or a pastry cutter. Sprinkle the topping evenly over the filling. Bake until the juices are bubbling and it’s lightly browned on top, about 40-45 minutes, covering it in foil at any time if the top is getting too browned. Transfer to a wire rack, and let cool for 15 minutes before serving. Serve warm or room temperature. It is delicious topped with whipped coconut cream, regular coconut cream or your favorite ice cream. Holy yum I want to leave work and go make this now! Oh yum yum I have got to make this! Delicious! I love how the summer brings the sweetness to berries! Looks amazing! I can’t wait to make this! 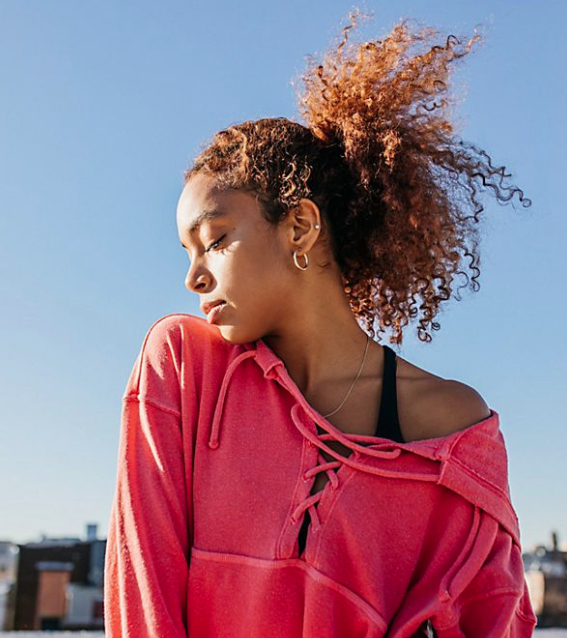 ok, definitely making this asap. I’m thinking it will pass as a breakfast dish if I top it off with greek yoghurt? sounds delicious, going to make it tonight! is there vanilla extract in the crumble topping? it’s listed at the bottom of the ingredients list, but not in the procedure. thanks! Just made this and I’m obsessed. It’s so good especially for paleo, gluten free, and or dairy free diets! I highly recommend it! This looks amazing!! I’m going to try it ASAP. So nice to see Gf and clean recipes! 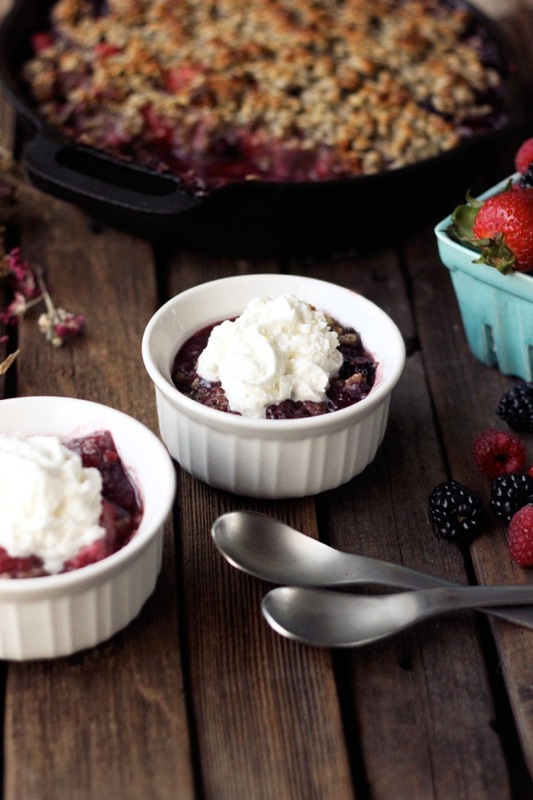 Can you use frozen berries? ?